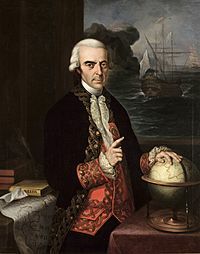 Antonio de Ulloa (12 January 1716 – 3 July 1795) was a Spanish general, explorer, author, astronomer, colonial administrator and the first Spanish governor of Louisiana. He was born in Seville, the son of an economist. Antonio de Ulloa Facts for Kids. Kiddle Encyclopedia.